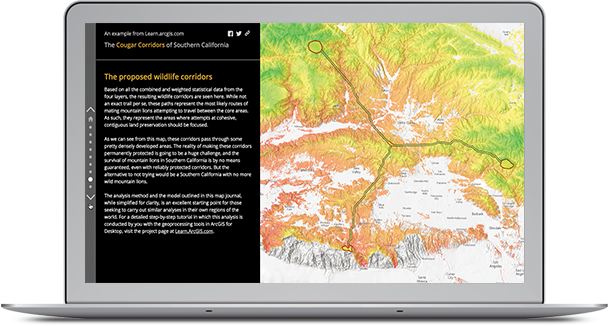 For certain types of analysis, like creating wildlife suitability surfaces, multiple layers of information can be brought to bear on the problem. The plight of the mountain lion has been carefully studied in the analysis documented at left, which incorporates elevation, terrain ruggedness, vegetation cover, protected land status, and other factors to help planners build wildlife corridors for the species’ survival. Rarely is it possible to gather data for all locations continuously; there is invariably a spatial or temporal scale beyond which the data is unknown. 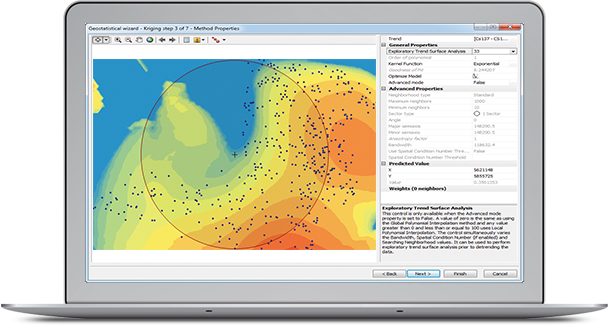 GIS allows you to predict values at unsampled sites from measurements made at point locations within the same area. Kriging is used to predict cesium-137 soil contamination levels for the entire area surrounding Chernobyl, from a set of soil samples taken at testing locations. You can choose from a number of different interpolation methods, depending on your data and the phenomena you’re modeling. Geostatistical methods, for example, provide interpolated values and, additionally, measures of uncertainty for those locations. The measurement of uncertainty is critical to informed decision-making, providing information on the possible outcomes (values) at each location. Spatial interaction models are used to estimate the flow of people, material, or information between locations. These models consider the attractiveness of a place (that is, some measure of why you want to go there) and the cost of travel (either financial or time cost) to get there. The measures are used to calculate the proportion of demand at each place. A spatial interaction model identifies the best site for a new fire station. 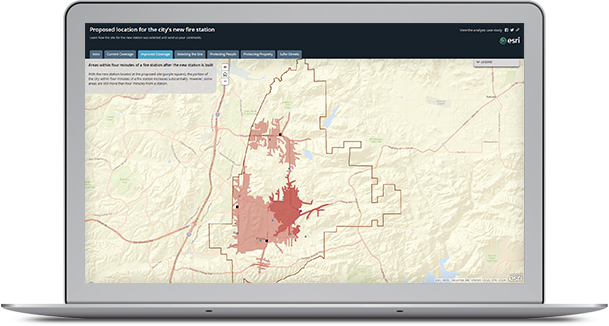 The analysis assures that the selected site, along with existing stations, conforms to the pattern of each fire station being within a four-minute travel time to homes in its immediate coverage zone.